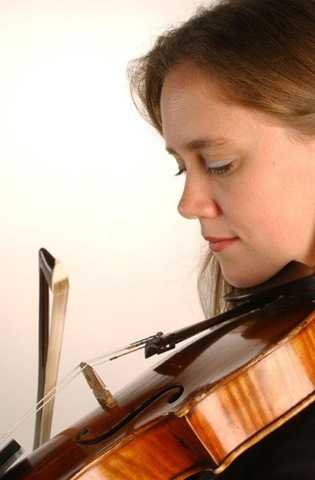 Weekend of Chamber Music’s Weekend of Chamber Music -July 18 & 19, 2015. SULLIVAN COUNTY, NY (July 20, 2015) – After Weekend of Chamber Music’s (WCM) Wind Ensemble performance on July 10, the WCM strings performed in the Eddie Adams Barn in Jeffersonville on July 17 and, for the first time in many years, at SUNY Sullivan on July 18 (with a little help from Sullivan Performing Arts). The two-performance weekend consisted of a somewhat diverse range of musical sources, all performed by WCM’s superb musicians. Our musical journey started in Vienna (where it was composed), with Beethoven’s “String Trio, Op. 3”, really more of a divertimento with its six movements, movements somewhat more serious than the divertimenti of Mozart and Haydn, but, oh my!, so easy for us to be fully aware of how he worked his magic on themes, melodies, sequential phrases and a key changes, with his inspired composing. Then it was off to Paris via Le Havre (Arthur Honneger was born in Le Havre and later was one the Parisian composers dubbed “Les Six”) with the surprise of the evening, Honegger’s “Sonatine for violin & cello.” Here again, in a sense, but not because of numerous movements, it could have been titled a divertimento – thanks to its being a most “diverting” work, unlike most of Honegger’s compositions which are more serious in nature. But it does still make us fully aware of Honneger’s compositional craft, much like in the Beethoven trio, and is full of rhythms and delicious French harmonies, and a bit of “slides” up and down the strings adding to the fun. On to London where dual-citizenship (UK and USA) composer Rebecca Clarke was born. A violist by “trade”, her “Two Pieces for Viola and Cello,” with two movements: “Lullaby” and its dialogue between the instruments, and “Grotesque” with lots of pizzicato and double harmonics, was lovingly played by Tawnya Popoff (right) and Caroline Stinson. On Sunday, we were treated to one of Andrew Waggoner’s (violin) and Caroline Stinson’s (cello) improvisations, an event that always leaves me in awe – I don’t mean any improvisation event – but when these two skilled improvisers are the only two doing it. They grab me from the start to the finish. Then there was Bach, but used more as an intro (read on): his “Air” from the “Goldberg Variations” performed by a WCM string trio. The two-day weekend closed as it opened, with Beethoven’s “String Trio”. An odd choice – to repeat what we had heard the night before. Interspersed between all of the above, we were given a fabulous overview of WCM’s 2015 composer-in-residence John Corigliano’s oeuvre (photo top left). First, his “Voyage” for flute String Quartet, which was dedicated by flutist Judith Pearce to the memory of sculptor and puppeteer Earl “Bud” Wertheim who passed earlier this year. He and his wife collaborated with WCM for a music and art creation for WCM’s first season. A very poignant piece, subdued, gentle and highly pleasurable. 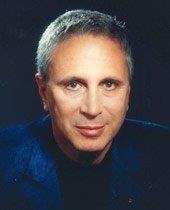 Then there was Corigliano’s “String Quartet,” much darker more complicated, tense and dynamic. Written in five movements, the fourth, a fugue, was incredible. As the theme passes from instrument to instrument, it is played in not only various tempi, but in “conflicting” rhythms, 4 against 5, etc. And twice “resolved” with a startling one-note unison played by all.. Fascinating and powerful, to be sure. And lastly, his “Fancy on a Bach air”, developed from the “Goldberg Variations Air,” performed by Caroline Stinson. 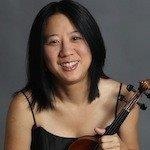 This was a second hearing for some of us, as she played this lovely piece in Livingston Manor in May. It is quite moving, perhaps because of its long phrases, but for sure from Stinson’s exquisite and heartfelt playing of it. 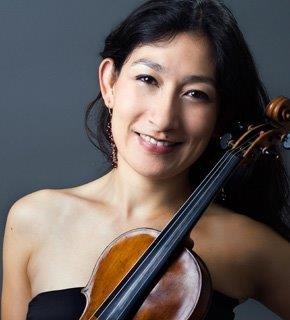 Exquisite playing is quite the norm for WCM artists, and that includes this weekend’s Judith Pearce, Sunghae Ann Lim (right) and Harumi Rhodes (above left), two world-class violinists, Tawnya Popoff (viola), and Andrew Wagonner (violin), and Caroline Stinson (cello). One nice happening was to see former Monticello High School student and one-time WCM “student” Andrew Trombley (left) perform with WCM on the Double Bass as part of the String Quintet (and flute) in Corigliano’s “Voyage.” Forgive me for getting onto the soapbox, but thanks go to Monticello High School for its wonderful music program. 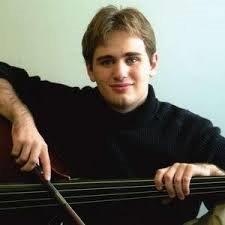 Andrew is now a Juilliard and Manhattan School of Music graduate! Up next for WCM is “Meet the Composer” (Corigliano) at the Catskill Distillery in Bethel on July 23, an open rehearsal on July 24, a final Sullivan concert in Jeffersonville on July 25, and one in Honesdale on July 26. Visit www.wcmconcerts.org for information and tickets. Hi – the dates on these two concerts were July 18 (Adams Barn on Saturday) and July 19 (SUNY Sullivan on Sunday)! Thanks for the kind words and support! The dates have been corrected. Thank you.